Special Promotion for the Holidays! *Ribbon colors and widths may vary. 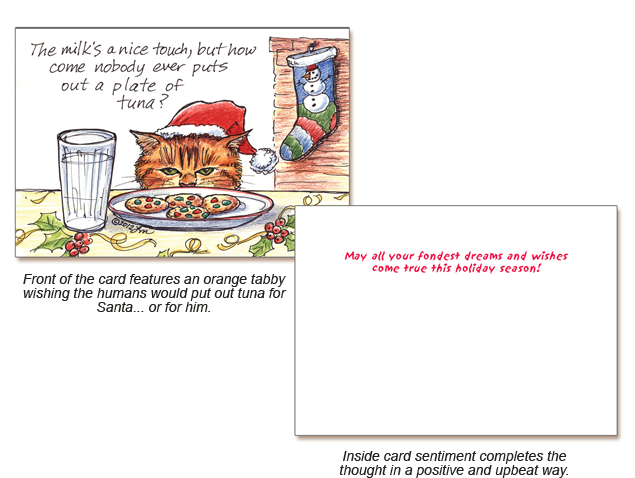 Just for the holidays, we have a limited number of Cattitude holiday cards, packaged in sets of 20 with 21 envelopes. 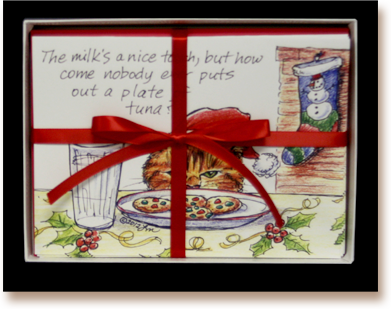 The title of this illustration is “Santa Claws and the Cookie Plate” – and you know this is exactly what a cat would think upon seeing the plate set out for Santa on Christmas Eve! Nicely packaged and gift-wrapped, these cards cost only $25.95 plus shipping*. Buy a set for yourself and another set as a gift for one of your cat-lovin’ friends or family members! *Domestic shipping rates in PayPal cart. For international orders, please contact us.